Nature education was in its infancy when William "Cap'n Bill" Vinal entered college at the turn of the twentieth century. A native of Norwell, Mass., (then called South Scituate), Vinal attended Bridgewater State Teachers College, graduating with the class of 1904, before taking a second bachelor's degree (1906) and master's (1907) in the Lawrence Scientific School at Harvard. One of the first formal nature educators in the nation, Vinal taught at the Rhode Island Normal School from 1911-1925, during the course of which he earned a doctorate at Brown (1922). A remarkably energetic man, dedicated to educating youth about the outdoors, nature, and conservation, Vinal held a string of short-term university appointments in nature education after receiving his doctorate, but throughout, he filled his summers with his love for the outdoors, directing Camp Chequesset (1914-1926), a nautical summer camp for girls in Wellfleet on Cape Cod, and later working as a ranger naturalist in parks in the western United States, or with the Nature Lore School for training nature counselors (1920-1926). 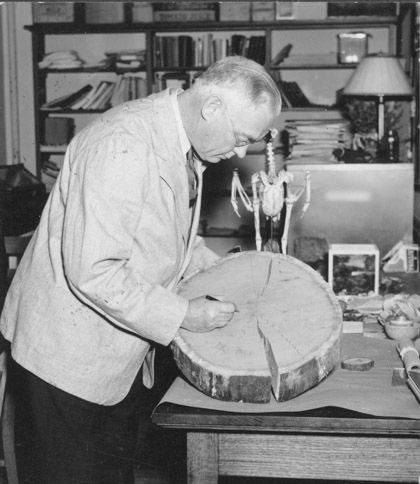 These experiences solidified his desire to introduce nature education into the universities, and in 1927, he was hired by the School of Education at Western Reserve University to do just that. A magnet for students and innovative instructor, he took regular field trips with his students to introduce them to nature in the northeast. Given the opportunity to create a similar program in his home state, Vinal gladly accepted. In 1937, he established the Nature Guide School at Massachusetts State College, the beginnings of what became the program in outdoor and recreation leadership. Spontaneous in the classroom and field, enthusiastic, and highly popular with his students, Vinal taught courses in conservation, outdoor leadership, nature recreation, and nature guiding. He was active in a range of organizations devoted to camping, nature, and conservation, including the Massachusetts Audubon Society, the American Camping Association, the Camp Directors Association, and the National Camp. He was a prolific author, best known for his books Nature Guiding (1926) and Nature Recreation (1940, 1963). After retiring from UMass in 1951, Vinal returned to his home in Norwell, Mass. He continued to lecture and write on nature and conservation, as well as local history, until his death in 1973. Vinal, William Gould: Conservation! Wake up Massachusetts! "A survey of the profession of recreational leadership at the University of Massachusetts"
"What is a major in nature education?" "Biological field studies: nature leadership"
Source of acquisition not recorded. Processed by Dex Haven, July 2009. Cite as: William Gould Vinal Papers (FS 138). Special Collections and University Archives, University of Massachusetts Amherst Libraries. Amherst (Mass.) --Social life and customs. Conservation of natural resources--Study and teaching. Vinal, William Gould, 1881- .